Overall width is 6.4ft Length 12ft. Deck Height 21". 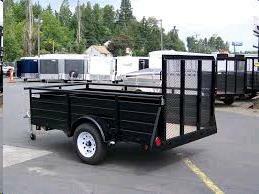 Weight Capacity is 1900lbs - TRAILER WEIGHS 900lbs. (GVWR 2,800). Cubic foot Cap: 3.7 cu ft. Sidewall height: 30". Works pretty good for most riding mowers, Raise Deck ALL THE WAY! NOT FOR LOGS, ROCKS, SAND OR DIRT!! * Please call us for any questions on our trailer 5x8 utility w sidewalls rentals in Langley, also serving Clinton, Freeland, Greenbank, and Coupeville.